Ajmal Shahzad claimed his first five-wicket haul since 2011 to lead Sussex’s charge to their second win of the season in the LV County Championship. 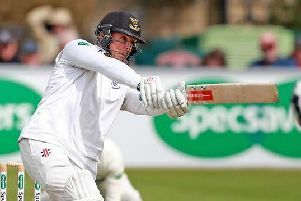 The 29-year-old finished with 5 for 46 on his first appearance at Hove, having joined the county from Nottinghamshire in the winter, as Worcestershire were bowled out for 185, having been 57 without loss chasing a target of 247. Shahzad, maintaining a fullish length down the slope, took 3 for 19 in his first seven over spell and returned before lunch to uproot Gareth Andrew’s middle and off stumps. Shahzad completed only his third five-wicket haul in the Championship when he had Sachithra Senanayake caught behind but Sussex were then held up by an unexpected last wicket stand of 51 between Ben Cox and Charlie Morris, before leg-spinner Luke Wells sealed Sussex’s 61 run victory when he had Morris taken at slip for 24. It was another chastening experience for promoted Worcestershire, who had been dismissed for 101 in the second innings when they lost their opening game to promoted Yorkshire last week. Openers Daryl Mitchell and Richard Oliver appeared to have given them the platform for a successful chase but Magoffin started their slide in the fourth over of the day when his nip-backer trapped Mitchell in front. Shahzad produced an unplayable yorker to account for Oliver before striking twice in three balls. Alex Gidman was hit on the back leg and Tom Kohler-Cadmore’s ill-advised slash outside off stump gave wicketkeeper Ben Brown an easy catch. When Matt Hobden replaced Shahzad he’d taken 3 for 19 in seven overs but there was no respite for Worcestershire. Hobden struck in his second over, bringing one back off the seam to defeat Alexei Kervezee’s push forward and Tom Fell was deceived by an arm ball from left-arm spinner Ashar Zaidi. Jack Shantry became the fifth leg-before victim of the innings to the fourth ball after lunch from Magoffin. Ben Cox held the lower order together with an unbeaten 46 but it was in vain. Joyce called Wells into the attack and he struck with his ninth ball.